The dogs were a tumbleweed of black fur as I opened the door to let them in. They had been outside to take care of their business and were eager to start their day, eager for their breakfast. Sasha whipped around my legs while Haley leapt in small bursts nearby. From the back door we typically walk through the dining room and kitchen and over to the hall closet where the dog food is stored. I started walking. The dogs followed, well, Haley followed. Something was going on with Sasha. Sasha’s tail, ever elusive in the chase, was clamped tightly in her mouth. She looked both startled and confused at her accidental tail capture as she tried to follow Haley and I. She spun in tight circles, tail in mouth, while simultaneously trying to walk in a forward direction towards the source of her breakfast. It was not working out well for her. I stopped, dislodged her tail from her teeth, and patted her and praised her for her success. She pranced off proud as could be, ready to take on the world one tail at a time. Raise your paw if you are a successful tail chaser. Successful tail chaser, right here! 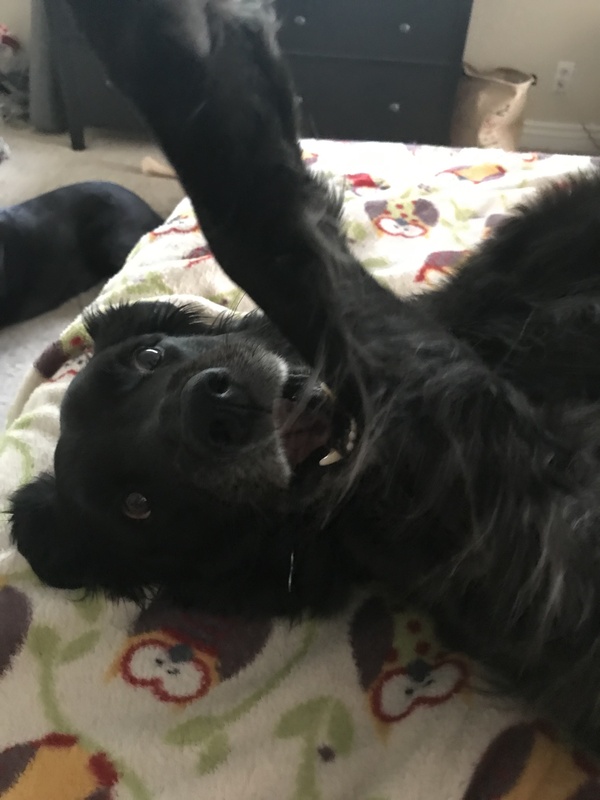 This entry was posted in Furry Feet (and fish) and tagged Dogs, Flat Coat Retriever, Humor, Life, Pets, Success. Bookmark the permalink. Dogs are such wonderfully simple creatures!